Last Thursday schools finished for the Easter break, and simultaneously Andrew’s parents arrived for the weekend and we all went to church to ‘help’ set up for Passover – it helps considerably to get there ahead of the crowds. Good Friday was a spacious, informal hands on experience at church. Thinking about Jesus’ hands and our own. It was meaningful, poignant as always to be exploring faith and reflecting together with all ages and abilities. Followed by a family afternoon with all its usual ups and downs, finishing with popcorn & a film. Easter Sunday was an early start for Andrew, followed by a whole church family celebration with bacon butties which the rest of us joined for. Afterwards a lovely table full of guests and good food for lunch, then back to church for our accessible service in which we explored clues from the Easter story to find out what happened to Jesus & his friends. Since then our visitors have travelled home, it has rained – a lot!- we have had lazy pj days with lots of TV, some gardening, some tidying, some window washing (I know, what came over me! ), table sanding, sleepless nights and talk of revision, and of course chocolate eating!! Did it really happen? Evidence for the Easter story. So, I have plenty of ideas for telling the Easter story at home but when it comes to the inevitable difficult questions like ‘Did it really happen?’, ‘How do we know he came alive again?’ am I ready?? I feel no need to justify God, he can defend himself! However, there are plenty of resources out there that can give me help in exploring these tough questions with my inquisitive, need-concrete-facts, take-nothing-at-face-value children. So I thought I’d get a bit ahead of the questions when they come and remind myself of some of the evidence. There is plenty of written historical evidence that would be considered trustworthy that suggests Jesus was a real historical figure. The Gospel ‘witness statements’ refer to places and events that there is archaeological evidence for, and they give accurate descriptions to those places and things. We can also find evidence – written accounts, early pictures and engravings, of crucifixion as a method used by the Romans during the right time frame. We can find out more information than we would want to about usual practice, and what crucifixion involved and see the way that the Gospel accounts describe it is an accurate one. “In 1968, an ancient Jewish cemetery was unearthed during construction. There, a heel bone was discovered in the grave of a young criminal that contains an iron nail matching the record of crucifixion. 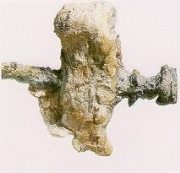 Remnants of a wooden board are still attached at one end, where the nail was bent over to hold the foot on the cross. There is evidence from outside the Gospels to look at that also confirms that Jesus was killed in this way. 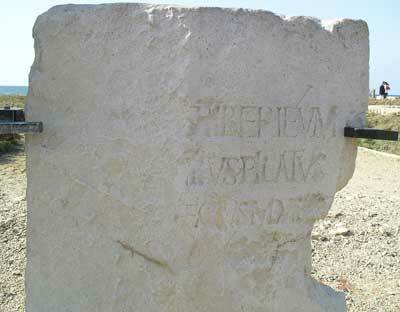 A Roman historian called Tacitus, and a Jewish historian called Josephus both describe Jesus as having been crucified. There is similar reference in the Babylonian Talmud, some Jewish writings. All of these texts are early accounts, not written later with hindsight or loss of information. And they all contain the same facts, Jesus was crucified, Pontius Pilate ordered it, Jesus was a notable figure who had followers. “Do we have evidence for Pontius Pilate outside the biblical texts? “The documents produced by Christian, Jewish and Roman writers form the most significant evidence. So, then on to the questions about Jesus coming alive again. We have evidence to back up the story that he really died. But then what? The Gospels all have the disciples finding an empty tomb. Matthew’s Gospel also tells us the Jewish leaders began spreading the rumour that the disciples had stolen the body to make it look as if he had risen from the dead. Even they were in agreement that the tomb was empty! And this is confirmed in some early Jewish writings called ‘Toledoth Jesu’. It is also interesting that the man who takes Jesus’ body and places it in an unused tomb is a Jewish leader himself, Joseph of Arimethea. He would have been well known, part of the Jewish high court. It would not have been possible for him to be written into the accounts of the Gospel within seven years of the event if this had not been true. And this being true also gives an inherent accuracy to the rest of the account. It has also been said that the accounts of the empty tomb have women as eye witnesses, women spreading the news. If Jesus’ disciples had wanted to start a fiction, a legend then they would almost certainly have had men as the eye witnesses to the empty tomb, and men would have spread the news. In that time a woman’s evidence was not recognized in court, their testimony was thought of as worthless. disclosure of God in them.” (Richard Baukham) There is a consistency between them as well as each being unique. They are personal accounts that also pass on theological understanding. Outside the Gospel accounts there is evidence from Tacitus, Josephus and also Pilny the Younger, a Roman Imperial Magistrate that the followers of Jesus did not stop, weaken or disperse after the crucifixion and the testimony about the empty tomb. Rather they grew dramatically in number. Were observed to worship Jesus, as they would a god. It is written that they met together weekly to worship despite growing persecution of any thought to be Christians. It is good to refresh my mind about all of this before the questions come my way. Not that it’s my place to ‘convince’ any of my children but it’s important to me to know that I have gathered resources so I can explore with them the best I can. ASD (Autism Spectrum Disorder), or ASC (Autism Spectrum Condition) as it’s more often becoming referred to as in recent months does mean for us, in our house that facts are important. Knowing why, knowing detail, being thorough (and intensely focused) are all important in life, and so they are important in exploring faith too. I have been busy drawing some brand new Easter colouring designs which I am excited to share here as free printables. We use the designs here at home, enjoying time colouring in and talking together responding to the words. I know some have been used in schools, youth groups and church small groups. Thank you for your feedback, it’s an encouragement to know the designs are being useful – and enjoyed! The garlands came together quite quickly, lots of the flower stems were wired and could bend and twist around the previous one. Some needed extra wire around them to keep them in place, but not many. Then I simply attached some string on either end (I made it in two halves) so I could hang it up on our existing hooks that I use for all kinds of bunting throughout the year. The wooden hearts were easily coloured with sharpies, and I hope to tie them into the garland with some Easter coloured ribbons when we’ve finished – in time to help us celebrate on Easter Day. We usually plan an Easter egg hunt in the garden too, and this year I have come across this lovely idea on ‘Bless this mess please’ for an Easter Day walk and scavenger hunt looking for things that are visual and tactile reminders of the story.